These photographs were taken between 1935 and 1943 for the Farm Services Bureau. 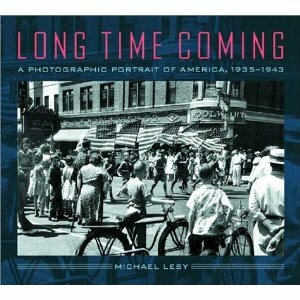 They were taken by such legendary photographers as Dorothea Lange, Marion Post Wolcott, Edwin Locke and Russell Lee. The subject matter ranges from migrant workers to subsistence farmers and even urban life in some of our major cities. They all show life in a stark and realistic way. From the cop on the beat to coal miners and the slums of Puerto Rico, this book captures the harsh reality of life a mere 60 years ago. That's not a long time. I was born only 19 years after the earliest of the photos were taken. When you look at the faces of theses people you are left with a sense of sadness for all that these folks could have been, were it not for the accident of Fate, that timeless and universal joker. I found myself wandering through the pages and wondering how I would have dealt with the circumstances evident in the photographs. But for all of the darkness in them, there is also a light. It is the light of the Human Spirit, which, when you come right down to it, is relentless. It is this ever hopeful state of mind; that somehow, someway, tomorrow might be better, that has kept civilization aloft through all of the dark times we have endured. I hope we never lose that spark, because if we do, we lose the light that goes with it.